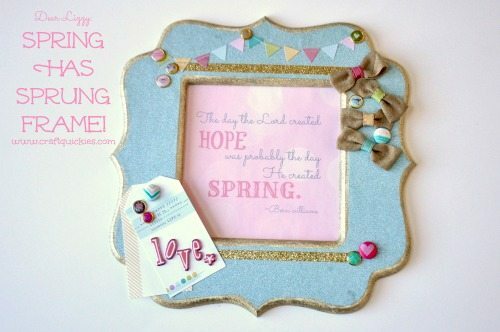 Dear Lizzy: Spring Has Sprung Frame! Alright, it’s time for me to be obnoxious: I am in love with my own project. It’s true. I am. 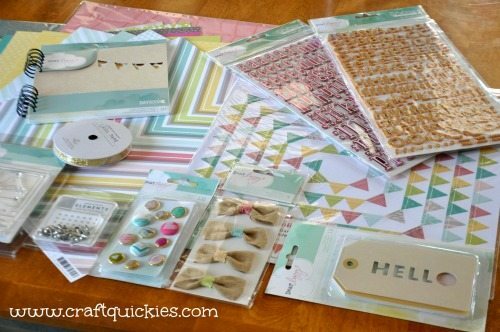 I was so thrilled to get a box of Dear Lizzy scrapbooking supplies in the mail from Americana Crafts to review, and that excitement paid off big time. I am in love with my own project. I love it because it is so different than the other things that I usually do. It is not bright, bold colors. It is not related to babies or kids. It is not a specific holiday decoration. It isn’t uber simple and clean looking. It feels soft and springy. It is busy and yet not. It is made from papercrafting supplies instead of fabric and ribbons. 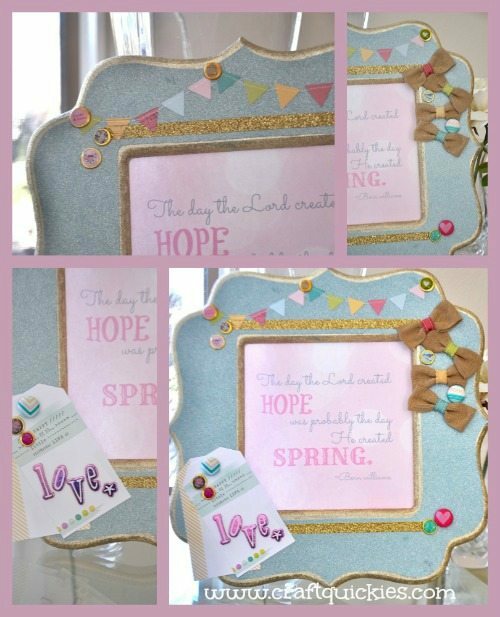 I am totally obsessed with the soft, glittery spring colors of these supplies. Lately in my soul I have been living and breathing spring pastels, so these supplies really got me where it counts! Let’s take a look at the supplies that I got. The package of goodies that I got is only a small sampling of the fabulousness that is the new Dear Lizzy line, created by Elizabeth Kartchner, which debuted in all JoAnn Fabric and Craft Stores a mere two days ago. They are just too fabulous for words. Whimsical, light, perfectly coordinated, and all with a touch of gold running throughout them. Swoon. Swoon. Again. 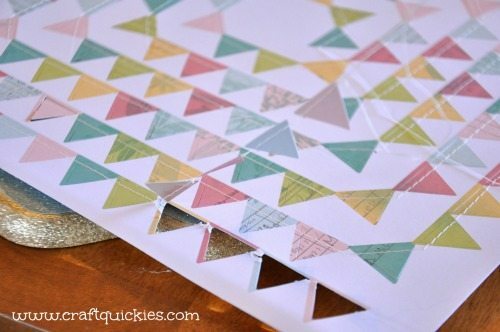 My favorite item in that bag of joy by far is this sheet of tiny, ready-to-pop-out colorful bunting. I believe they called it Flutterbys. Whatever it is called, it has won my heart. What a fabulous idea! In the days of yore, before I had children, I was on a major scrapbooking kick, and there are hundreds of dollars of supplies in my basement to prove it. Yikes. But it has been a long time since I was moved by papercrafting supplies, so I did have to ponder and ruminate on this project for a while. 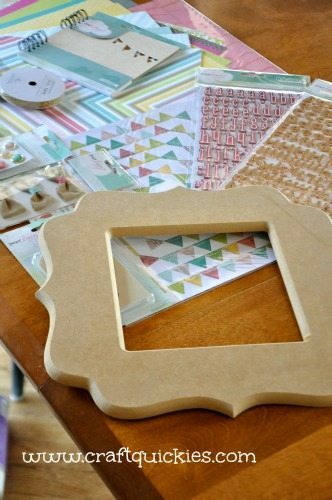 However, I was walking through a local scrapbooking store looking for inspiration and I spotted this beautiful cardboard frame. It spoke to me. I had to have it. And so I bought it with a coupon and went home to play. Jade was eager to play, too. Swoon times a million, right?! The process was simple. I laid out all of my supplies and played around until I dreamed up what I wanted to do. There was a lot of trial and error. Usually when I start a project I have a clear vision in mind with as few steps as possible so that I can power through it in a hurry during naptime. This was not that project. I allowed myself to enjoy the process of creating this project. It felt so good! I urge you to do the same every once in a while! 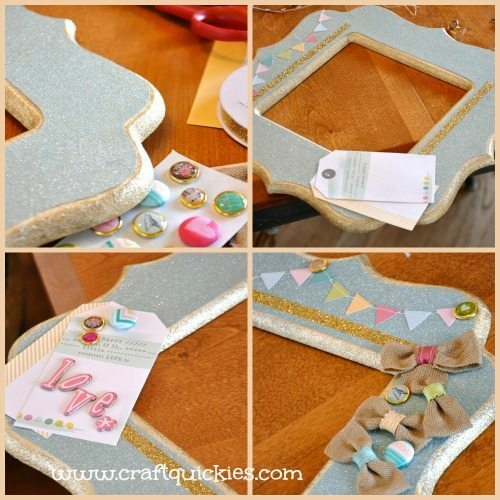 Set aside some time to just play with your creativity! I started by painting the inner and outer edges of the frame with a buttery yellow paint I had in my cupboard. Once the paint dried I mixed a bit of Mod Podge with extra fine gold glitter and painted that glittery goodness on top of the buttery yellow paint. I love the color that it ended up! Next I chose the glittery aqua paper from the Dear Lizzy line and laid the frame on top of it (face down) and traced the shape. Then I carefully cut the paper and trimmed it slowly until it fit and used a gluestick to generously glue it on. It is not a perfect match. And I don’t care! True story. Finally it was time for embellishments! 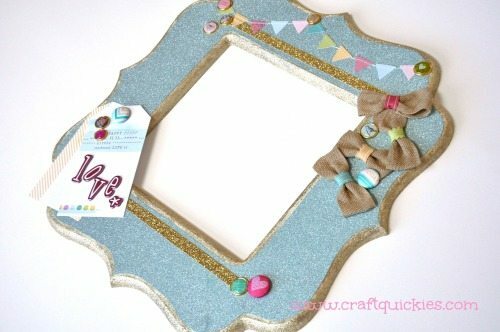 I loved playing with the tags, bunting, the burlap bows, the sticker letters, the glitter tape and the brads. I started with a couple of strips of glitter tape (my new obsession). Next I used a gluestick for the bunting and the tags and added the “Love*” lettering stickers to the tag. I love the pop of pink those stickers bring into the design. Then I cut the backs off of the brads with scissors and hot glued the brads and bows to the frame, after much deliberation and experimentation as to where I would like them, of course. I love it. It is pure, glittery joy. BUT…..it is empty. I thought about putting a family picture inside of it, which I may still do someday. But, in all honesty, I was too lazy to drive to the store to pick up the picture and I needed it the same day. So, you know, I decided to spend a long time learning how to make a printable instead. Because that makes a lot of sense. Oh well! I am thrilled with the way it turned out, and it forced me to stretch myself. 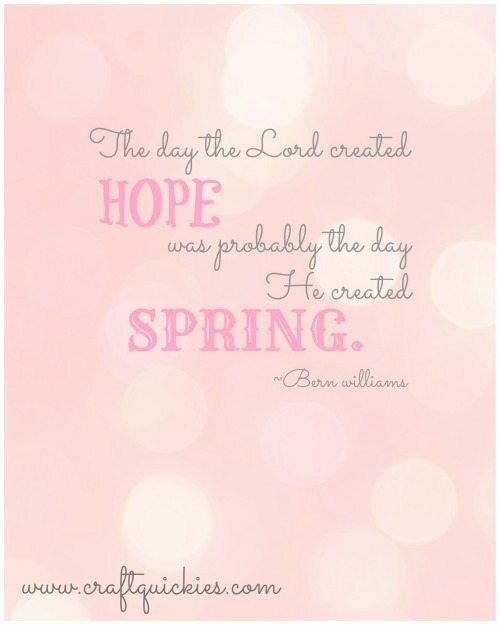 I typed “springtime quotes” into Google and found this wonderful one on a site called Quote Garden. When I read it I knew: it was the one. I kept the Printable very simple since my frame is so busy. It is formatted for an 8×10 frame, but it had lots of sidebar wiggle room since my frame is 7×7, so I bet it would be great in smaller frame printouts as well. I hope you like it as much as I do! You can download it in its full (watermark free) glory here if you are interested. *This is for personal use ONLY! Thank you for respecting my work. Now let’s just take a closer look at the finished product. What do you think? If you love these supplies as much as I do then you need to hurry to your local JoAnn Fabric and Craft Stores to find them! You won’t want to miss the other projects that my fellow bloggers are making with these gorgeous supplies, so be sure to follow along with American Crafts on Facebook, Twitter, and Pinterest! So cute Sarah! But I think your little girl is just a little cuter! It’s easy to see why you are in love…It turned out great! It’s so beautiful! All of the products you received are really cool. So cute! I just love that color of glitter paper! 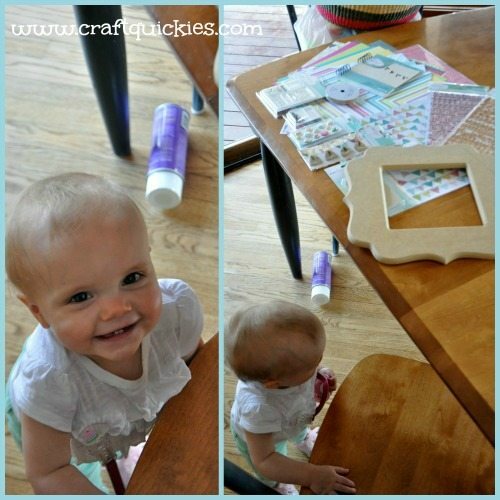 Sarah, What a fun spring project! Love how it turned out, but even more? I love that you love it! Thank you for the opportunity! Please keep me in mind for the future!